Fitbit Flex 2 is the first swim-friendly fitness tracker from the company and we can almost hear the collective sigh of relief that we can finally have the waterproof tracker we've been waiting for. In the face of the Misfit Speedo Shine 2 and gamut of other water-resistant trackers, it's taken Fitbit a long time to answer the call of swimmers. And on paper at least, the Flex 2 looks like the real deal. Priced reasonably at $99.95, the features aren't as advanced as the Fitbit Charge 2, instead it's geared towards the entry level crowd who want a tracker that's slim, versatile and of course, waterproof. Aside from the simplicity of form factor and usage, the Flex 2 is a far cry from the likes of its years old predecessor, and that's a very good thing. We gave our initial verdict after a few weeks of testing and now that we've spent more time with the device on our wrists, here's what it's like to live long term with it. Flex 2 really is a slim little tracker that's hardly noticeable at all on the wrist, which is a nice change of pace. The wearable is much slimmer in appearance than the first Flex because the tracking module is 30% smaller. The Alta looks like a beast next to it. Okay, not really, but Flex 2 is noticeably more petite and is without a display. It's also the ideal piece of fitness tracking camouflage, especially when the module is tucked away behind a bangle or pendant. Our feelings haven't really changed on this front having spent more time with it around our wrist. It's still not much of a looker, but it's as light and comfortable tracker you can wear day and night. In a Classic band, the textured elastomer is soft but not so pliable that you'll be able to clasp it easily. One of the biggest criticisms of previous Fitbits including the Flex has been the suitability of the clasp mechanism. You were just never fully satisfied that it would stay put. It's an entirely different prospect with the Flex 2. Once the clasp is in place, good luck trying to yank it back out again. That does make it a tad more fiddly to get it off your wrist in a hurry, but we're all for the added secureness you get with the Flex 2. If you want to change up your Flex 2, there are plenty of options. Unlike the old device, the new Flex is chasing the fashion conscious by letting wearers switch out the original bands for bangles, pendants and a whopping selection of seven Classic bands. The colours you can choose from in the Classic collection are: black, navy, magenta, lavender, pink, grey and yellow. There are also $29.95 three-packs you can get with an assortment of colours, called the Sport Pack (navy, grey, yellow) or Pink Pack (magenta, lavender, pink). Alone, a Classic band isn't too expensive at $14.95. The device is similar to other screen-free fitness trackers where there are LED lights to notify you about calls, texts and also hourly reminders to move. Lifting your arm up will make the vibrations stop but the lights will keep flashing for phone calls. At the moment, it doesn't seem like the lights can be personalised to your liking. Rather, Fitbit has a default pattern of lights and vibrations to help you differentiate between calls, texts, silent alarms, reminders to move and daily goal progress. No third-party notifications are recognised either, which is frustrating. One of the things we just haven't got to grips with is the notification LED system and how that corresponds to different notifications on your phone. It will remind you of the discreet notification support Misfit uses on its Shine and Flash fitness trackers. It's fine as far as viewing tracking progress throughout the day. The more white lights that illuminate on the band, the closer you are to your target. It's not quite straightforward when you feel a vibrating buzz at the wrist and see a colour flash up to signal that someone is trying to get in touch. Bottom line, you're still going to be looking for your phone to deal with the notification. Fitbit's explained that the team wanted to keep it simple for now but isn't closed off to the idea of customization. Right now, tapping on the Flex 2 shows your goal with a green light on top and white lights showing progression, the yellow light means alerts and blue stands in for both phone calls and texts. The latter is differentiated by a longer vibration for calls. 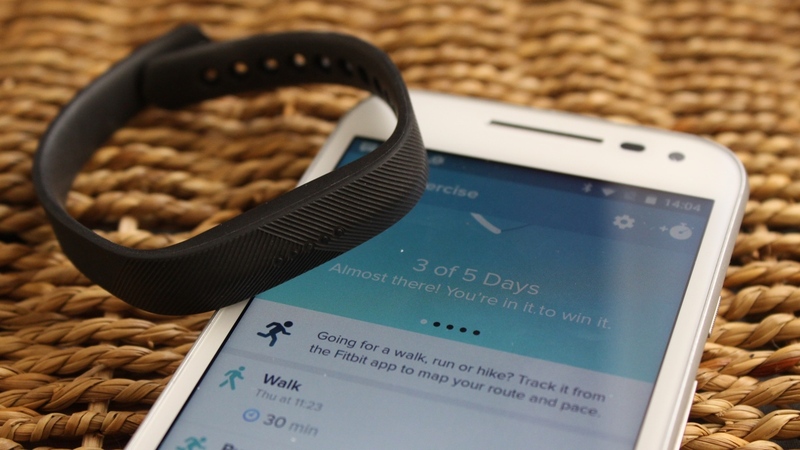 We're hoping Fitbit will eventually allow customisation to make it more personalized. Thankfully the vibrations themselves aren't too jolting. The Flex 2 is as simple as you can get. It's capable of tracking steps, calories burned, active minutes, hourly activity and sleep, all of which can be auto-detected with the SmartTrack feature. Currently, the exercises that can be auto-tracked include walking, running, outdoor bike rides on pavement, elliptical, aerobic workouts (Zumba or cardio kickboxing) and sports like tennis, basketball and soccer (among others according to the app). We used the Fitbit Charge 2, Samsung Gear Fit2 and Apple Watch Series 2 to measure the step counting and all matched up with the Flex 2 without any major issues. You'll have to head to the app to see how many steps you've taken and to check on specific numbers for goals, but tapping on the front of the Flex 2 will elicit corresponding lights. Each white light represents 25% of your goal, meaning if your goal is 10,000 steps and you see four white lights, you've completed at least 7,500 steps. When you reach your goal, the Flex 2 vibrates and the lights flash in 'celebration'. Tapping again to check your progress will continue to show the same row of flashing lights. Sleep tracking has been pretty good and I've used it against the Charge 2 – which has been pretty accurate – and the FitSleep device. On the whole, Flex 2 has matched up well with the Charge 2 and only a few wake-up times have been off. It also synced up with how much time I spent sleeping. Aside from swim tracking (which we'll get onto next), we put the automatic run tracking through its paces as well. You won't get any advanced metrics like you'll get on a GPS running watch, instead opting to record exercise duration, calories burned as well as measuring the impact it has on your day and active minutes. As you'll see from the screenshots below, it's a case of the Flex 2 being in the ballpark as opposed to being on the money. The workout duration is a few minutes off and calorie is roughly the same as the TomTom Spark 3 running watch we tested it against. Unlike the Charge 2, there's no heart rate monitor or ConnectedGPS, which means you won't get running distances even if you take your phone along for the ride. One thing the Flex 2 really does have in its favour is its swim tracking capabilities. It can be worn up to 50m (including in saltwater). Swimming can be auto-tracked with duration and laps of four strokes monitored: freestyle, breaststroke, backstroke and butterfly. For non-swimmers, you won't have to worry about hopping in the shower with it on or heading out to the beach. If you plan on swimming with the Flex 2, know that it won't give you the most advanced metrics. What you do get is an overview of your calories burned in a chart, the amount of time you've swam, distance, pace and impact on your day. Specific strokes aren't noted in your app, and Moov Now remains one of the few swim trackers capable of this. You'll also have to turn on the swim track feature before you hop in the pool. It's turned off by default to conserve battery life "for those who do not regularly swim, so make sure you venture into the app to sort. We explain all in our Fitbit Flex 2 tips and tricks. You must also swim continuously for SmartTrack to work. Meaning if you're not a strong swimmer, the Flex 2 has a harder time recognising your strokes and you'll need to adjust active running minutes (the amount of time it takes to recognise you're swimming) in the Fitbit app. You can also set the pool size to increase tracking accuracy as it seems to be set to 25 metre pools as a default. As long as you're willing to accept that you're not going to get myriad of swim metrics here, it's still a pretty solid swim tracker. At the most it's been three or four lengths of matching the swimming watches we've tried it against. The baseline data is going to be enough for casual swimmers throwing in a few swimming sessions as part of their weekly routine. One thing to remember is the inclusion of swim tracking is huge in itself. It doesn't have the other features stocked in higher-end fitness trackers like the Garmin Vivoactive or TomTom Spark, but the Flex 2 is definitely the cheapest of the bunch and you're still getting a good experience here. If you've used a Fitbit before, you'll know what the Flex 2 app looks like since it's the exact same interface. It's a good ecosystem, full of social challenges with badges to earn, all clearly laid out and easy to use. The release of Flex 2 and Charge 2 came with a set of new challenges as well that are now available across the Fitbit lineup. Called Adventures, you can choose from various step goals that take you through different locations. For example, it takes 15,000 steps to 'walk' on the Yosemite Vernal Falls hike. That means every step you're taking at home, work, wherever is then matched up to the hike Fitbit's set up in the app. You even get to see your steps mapped out with the app telling you how many more steps you need to go. You don't have to complete the whole thing immediately, though the app gives you a daily destination with points to meet based on your seven day step average. Along the way, smaller step goals unlock little things to keep you motivated. Aside from that, you get your usual gamut of food, water and weight logging. Days are presented on the main screen, and you tap a metric to get a broader look at your performance. For example, tap on the sleep score for the day and you can take a look at your sleep over time, and filter by day, week or month. Overall, Fitbit's app is one of its strong points. Easy to use and clear, it offers enough data without feeling overwhelming. You can also sync up multiple devices to one phone. In the past it didn't always work right, and you'd have to un-sync, re-sync and go through a whole process but now it works like a dream. The five-day battery life of the Flex 2 is surprisingly mediocre. Of course, it's a matter of how you use the tracker, but I'd expect at least seven or more days since it doesn't rely on a screen for notifications. For the first test run, we used it with call, text and notifications to move turned on, meaning it buzzed whenever these things happened. It was on to track activity as well. Interestingly, the Flex 2 stayed true to the paper description (unlike the Alta) and lasted five days. If you turn off notifications and only used it for activity tracking you can get up to nine days. It's clear that with notification support, activity tracking and swim tracking all switched on, it does mean the battery takes a hit. Charging it is a similar process to the Fitbit Blaze: you have to remove the tracker module and insert it into the USB charger. Just be sure to pay attention how the Flex 2 clips in place into the cradle. We've managed to place it in incorrectly on a few occasions and been left with an uncharged device. We prefer the clasp style of Alta and Charge 2 for convenience, but it's not a deal breaker by any means. For such a small device that doesn't do that much, charge time took about two hours. Has living longer with the Flex 2 altered our opinion of the waterproof tracker? Yes and no. We still feel the same about the design and the confusing LED light-based approach to notification support. Battery life still doesn't blow us away either, but it will get you a week of tracking. We are more positive about its core feature and that's the swim tracking. Yes, it is basic, but it serves up a better swimming experience than similarly priced trackers. Fitbit’s software still lack those meaningful insights we crave for, but does the basic activity tracking well. The SmartTrack tech is a bonus, but again delivers very basic information. If you like swimming and can live without the more advanced metrics of a dedicated swimming watch, then it’s still a decent buy.